As previously reported, USDA awarded a coalition of partners led by the Illinois Corn Growers and the University of Illinois a $5.3 million Regional Conservation Partnership Program (RCPP) agreement (see farmdoc daily, February 25, 2016). The agreement was for implementation of the Precision Conservation Management (PCM) effort to help farmers reduce nutrient loss from their fields by adapting precision technology, data and farm business management principles to the nutrient loss challenge and conservation. This article provides an update on the PCM effort. PCM is a service program that combines farm business and financial practices with precision technology and data management to help farmers better integrate and manage conservation on their farms. It will provide analysis, technical assistance, financial assistance and data assessment to help reduce complexity and manage risks associated with the nutrient loss efforts. PCM combines $9.86 million in private matching contributions (both in-kind and cash) with $5.3 million in NRCS conservation program funding to help farmers manage conservation practices to reduce nutrient losses. PCM uses farm data to serve farmers’ interests in the nutrient loss effort, applying business principles to conservation practices and using precision technology to manage risks associated with conservation decisions. For the farmer, this includes web-based tools that provide reports on agronomic and financial performance of conservation on the farm. It also looks to precision technology to help improve conservation practice effectiveness and reduce the risks and management challenges associated with conservation practices. Conservation specialists work directly with the farmer on data collection and practice analysis, as well as assistance with enrollment in NRCS programs. With data security as a top priority, PCM uses aggregated, anonymized farmer data to help demonstrate the impacts of conservation decisions on farm financials and water quality impacts. One of the unique work products provided by PCM is a custom developed Resource Analysis and Assessment Plan (RAAP) for the farm that begins with a sustainability assessment for each field. This will work in conjunction with the Field Print Calculator developed by Field to Market. In part, this is an effort to analyze the strengths and weaknesses of the farmer’s current practices, including nitrogen application practices, permitting a benchmark against other fields. Out of this assessment, a field-by-field plan can be developed to reduce nutrient loss. The assessment will also help identify all resource concerns for the farm and evaluate practices that can help address those resource concerns. This leads to a five-year plan to implement practices and identifies potential financial assistance from NRCS programs such as the Conservation Stewardship Program (CSP) and the Environmental Quality Incentives Program (EQIP). Finally, working with the Farm Business Farm Management Association (FBFM) a detailed financial analysis of the conservation efforts can be completed that include field-by-field profitability estimates. Farm business planning through PCM will involve short-term financial planning tools for practices such as cover crops and nutrient management. It will also provide long-term budget analysis for conservation practices. The effort will involve the farm’s data, including financial, as well as benchmark data to help the farmer compare options and manage the financial and profitability impacts associated with reducing nutrient losses. This might include the cost of adding cover crops into the commercial crop rotation, changing tillage practices and/or moving to split application of nitrogen fertilizer. PCM can help look at the impact these practices may have on the farm’s finances as well as on water quality and its soils. 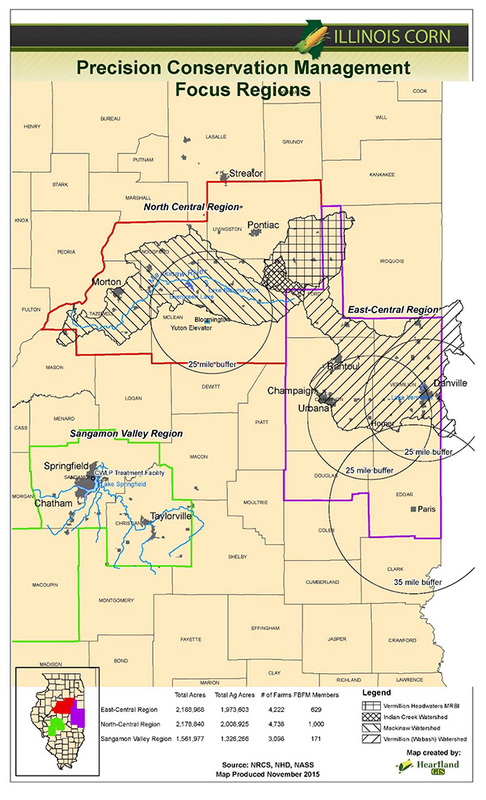 PCM is initially focused on 12 counties and 3 regions in Illinois and will target critical watersheds such as the Mackinaw River, Indian Creek, Vermilion River and Lake Springfield. The image below shows where PCM is targeting its efforts in Illinois and farmers in these regions can contact the Illinois Corn Growers or go to the PCM website for more information. The first year goal is at least 50 RAAP in Illinois and Illinois Corn Growers report that they currently are on track to reach that goal with 58 farmers signed up. RCPP was created by the 2014 Farm Bill as an innovative approach to large-scale natural resource challenges. It uses existing conservation program authorities in a more flexible and coordinated manner, coupled with contributions from private partners. At risk of being lost amongst the thicket of acronyms is the progression of conservation policy. For much of its history, conservation was a policy in service of the commodity price support system; a method for renting acres out of production in order to increase prices. The 1985 Farm Bill began modern conservation policy with more of a focus on natural resource challenges. That trend has continued with an increasing focus on working lands policy that seeks to blend conservation practices with production. RCPP is a recognition that natural resource challenges are often at a regional or landscape scale, needing to be addressed across many farms rather than one farm at a time. PCM is a recognition of both the technological advances in farming and the individual farm management challenges embedded in larger regional conservation efforts. A fundamental question here is whether RCPP and PCM offer a potential bridge between the landscape or regional scale of conservation challenges and the individual farm operational challenges. Future farmdoc daily articles will provide updates and analysis of PCM in operation.